The Nexus 5 smartphone has had so many leaks that it barely needed an official announcement. Still made by LG, the latest Nexus smartphone brings all of the expected upgrades; a larger display with a higher resolution, a faster processor, etc. The Nexus 5 is also the first device to ship with Android 4.4 KitKat, which brings a lot of important changes, including a more refined UI. While the Nexus 5 doesn't have anything that distinguishes it from other flagships, it's price tag is very appealing as always, and the pure Android experience may be more appealing to some users than competitors' modified software. The Nexus 5 may be cheap, but its design doesn't look very cheap at all. While it may not be as premium as the iPhone 5s with its aluminium build, it's still solidly built. The back of the smartphone takes a leaf from the 2013 Nexus 7's design with a matte finish, sold in either black or white. A large Nexus logo is rather awkwardly placed horizontally on the center, accompanied by a small, vertically oriented LG logo on the bottom. An 8 MP camera, which by the way slightly protrudes from the chassis, sits on the top left of the device, accompanied by an LED flash below the camera. The phone's design isn't very rectangular and consists of slightly curved sides. The front, of course, consists mostly of the 4.95" 1080p display. The display is in line with what is expected from a flagship device nowadays, no more, no less. As the Nexus 5 is based on the LG G2, the bezels on either side of the display are very narrow, while the top and bottom bezels are, well, regular for a smartphone. The Nexus 5 isn't exactly the skinniest flagship smartphone available. Measuring 8.6mm thick, it's considerably thicker than the iPhone 5 and 5s, and also thicker than Samsung's Galaxy S4 (7.9mm). It's thinner than the LG G2, though. 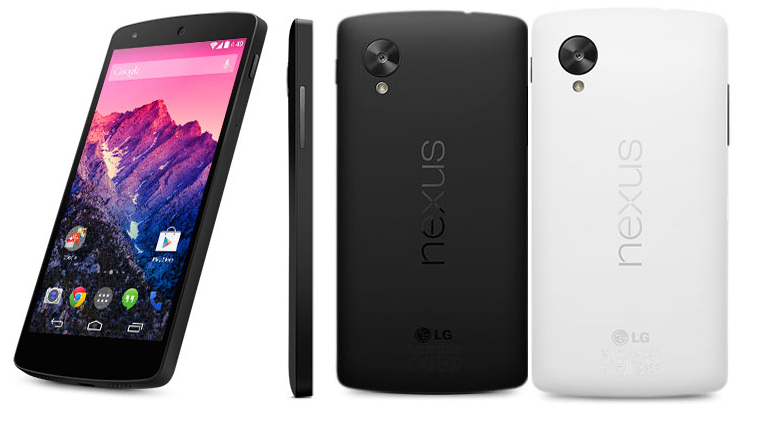 Nevertheless, while it may not be the thinnest, you can't possibly call the Nexus 5 thick. After all, that extremely attractive price tag requires some minor compromises, and anyway, for a $349 phone, the Nexus 5 is doing very well on the thinness department. The Nexus 5, weighing 130g, isn't lighter than the iPhone 5 and 5s (of course, it has a much larger display and battery), but is one of the lightest 5" flagships, as it's considerably lighter than the LG G2 (143g) and has the same weight as the Galaxy S4. Not bad for a phone with such a low price. The Nexus 5 is but another phone that enjoys the extreme power offered by the Snapdragon 800 processor. Powered by four Krait 400 cores clocked at 2.3GHz and the monstrous Adreno 330 GPU, you're pretty much dealing with one of the absolute fastest smartphones available. That, combined with the trimmed down Android 4.4 KitKat OS and the absolute lack of any OEM customizations and bloatware, gives the Nexus 5 impeccable fluidity and performance. The Nexus 5 isn't an attempt to revolutionize the smartphone market through fingerprint sensors and weird hand and eye gesture controls and whatnot. Quite the contrary, it's supposed to be a basic smartphone with flagship qualities, achieving success through the simplicity of its hardware and user interface. The exclusion of all those bells and whistles is what allows for its very low price, and for some people, that may be just about perfect. Some people don't need, or don't want, a bunch of extra hardware and software features they'll barely ever use on their phones, in other words, some people just need a powerful yet easy to use phone, and that is the space the Nexus 5 intends to fill in. And it does so very well. This phone has the basics a flagship requires nowadays, a 5" display of 1080p resolution and a Snapdragon 800 processor, and also has a basic, unmodified OS, and that's pretty much it. If all you want from a phone is for it to provide a fast, fluid experience for all use cases, from texting to gaming and watching videos, I would strongly recommend the Nexus 5. I would only recommend you to get another phone if basic isn't your kind of thing, that is, if you like the complexity of OEM-modified UIs and nifty hardware extras like fingerprint sensors. But the Nexus 5 is, with no doubt, the best basic smartphone flagship this year.